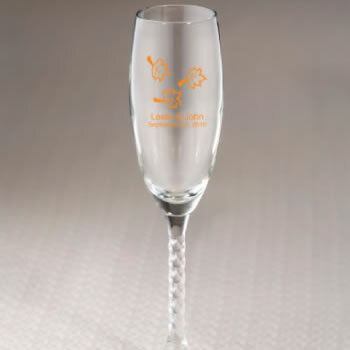 Drink to your future happiness with our personalized fall champagne flute favors. Choose from a variety of beautiful autumnal designs and include your names and event date to make these fall favors truly unique. A wonderful addition to any autumn décor, the personalized fall champagne flute favors are made of clear glass and measure 8.5" tall and 2.125" in diameter. I placed a rush re-order due to a broken flute in the first order. I needed to receive it within a few days and nicepricefavors came through for me! They were beautiful! Thank you so much! I didn't have that many days before I was to go to St. Thomas to celebrate my Mom's birthday, but you came through for me in a fantastic way. The flutes were delivered to me a few days before I departed and they are beautiful. Thank you for accommodating me and my needs. Everyone loved them. I have order from them before and continue to order from this reliable company . They really live up to there name nice price favors. There prices are the best the over any other web site offer. There favors make you event look like you spend a million dollars when you really spend pennys. I would and have recommend to friends, and family .